Chopin, Frédéric, 1810-1849. Concertos, piano, orchestra, no. 2, op. 21, F minor. Allegro vivace (Album leaf) . Allegro vivace from Chopin's Concerto for piano and orchestra no. 2, op. 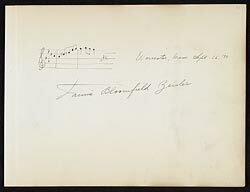 21, in F minor (album leaf) : manuscript in the hand of Fannie Bloomfield-Zeisler, 1890 Sept. 26.